NOTE: Merijn sold HijackThis to TrendMicro. 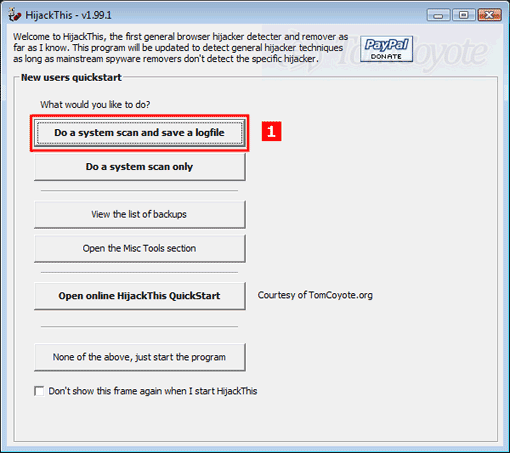 They’ve released HijackThis V2 (version 2), and the quick start guide for it can be found here. Unless you’re using Windows Vista, HJT v2 is not required. 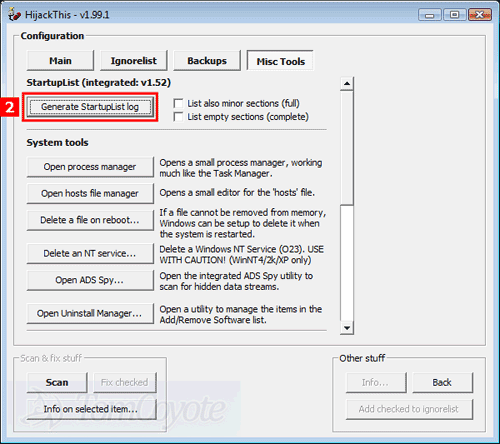 HijackThis examines certain key areas of the Registry and Hard Drive and lists their contents. These are areas which are used by both legitimate programmers and hijackers. Some items are perfectly fine. You should not remove them. Never remove everything. Doing that could leave you with missing items needed to run legitimate programs and add-ins. This Page will help you work with the Experts to clean up your system. Many people download and run HijackThis after visiting a Computer Tech Help Forum. This section is designed to help you produce a log, post the log at that Forum and finally remove the items as directed by the Member helping you. This involves no analysis of the list contents by you. That will be done by the Help Forum Staff. It is a Quick Start. If you downloaded the file here, it’s self-installing. Simply download to your desktop or other convenient location, and run HJTSetup.exe to install. Once installed open HijackThis by clicking Start -> Program Files -> HijackThis. This is how HijackThis looks when first opened: 1. Click the button labeled Do a system scan and save a logfile. 2. 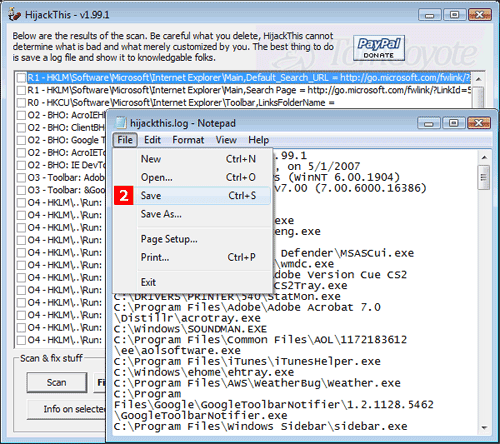 HijackThis will quickly scan your system, and then open two new windows. The results of the HijackThis scan, and hijackthis.log in Notepad. Save hijackthis.log. By default it will be saved to C:\HijackThis, or you can chose “Save As…”, and save to another location. If you’re receiving help online, hijackthis.log contains the info that’s required to receive analysis and assistance. It’s usually posted with your first topic on a forum, along with a description of your problem(s). Highlight the entire contents. Copy and paste the contents into your post. DO NOT fix anything. Wait for help. Note #1: It’s very important to post as much information as possible, and not just your HJT log. This will increase your chances of receiving a timley reply. Note #2: The majority of infections can be removed using free tools, and don’t require a hijackthis log analysis. Geeks to Go has an excellent malware cleaning guide. Note: Please, DO NOT post your log to more than one forum. Volunteer resources are limited, and that just creates more work for everyone. StartupList is a utility which creates a list of everything which starts up when you boot your computer plus a few other items. When run, it creates a file named StartupList.txt and immediately opens this text file in Notepad. A StartupList will not be needed with every forum posting, but if it is needed it will be asked for, so please refrain from posting one unless asked. 2. Click the Generate StartupList log button. A confirmation box will pop up. Click Yes. The Startup list text file will now be generated and opened on the screen. If you are posting at a Forum, please highlight all, and then copy and paste the contents into your Reply in the same post where you originally asked your question.